Crystal Kalyana Pacey of In the Good Old Days of Classic Hollywood is our hostess for the Remembering Barbara Stanwyck Blogathon. Click HERE for the tributes to the amazing actress. The 1953 release All I Desire, based on the novel Stopover by Carol Ryrie Brink, is the link between two distinct phases of director Douglas Sirk's career. The half dozen or so films for Universal preceding All I Desire have the flavour of comedic Americana - Week-end With Father, No Room for the Groom and the period pieces, Has Anybody Seen My Gal, Meet Me at the Fair and Take Me to Town. After All I Desire we find the opulent soapers such as Magnificent Obsession, The Tarnished Angels, Imitation of Life and All That Heaven Allows, a film that compares interestingly to our choice. 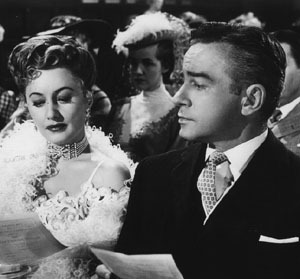 All I Desire bridges these movies as a woman's picture, a period piece, and an excellent showcase for Barbara Stanwyck. Vivacious Naomi Murdoch would seem to have had it all with a loving family and a secure social position, but she wanted more. She thinks she may have found it in the equally restless Dutch Heinemann played by Lyle Bettger. She thinks she will find it by following her dream of a career on the stage. Life upon the wicked stage was not all it was cracked up to be and Naomi is scraping by in bottom-of-the-barrel vaudeville and burlesque houses, too proud to return home. Naomi's middle child, daughter Lily played by Lori Nelson (Bend of the River, Destry) is about to graduate high school and dreams of following her mother into the theatre. Lily sends an invitation to Naomi to return for the graduation ceremony and to see her play the lead in the school play. Naomi accepts the invitation and returns playing the part of the grand and successful lady. Naomi knows how to make an entrance. The black and white photography by Carl Guthrie (Christmas in Connecticut, Storm Warning) paints a nostalgic feel for the town with especially appealing shots of and through the windows of the family home. Barbara Stanwyck glimmers in a white gown by Rosemary Odell when she makes her grand entrance in the darkened auditorium to attend the school play. Outstanding! The Murdoch family at home. 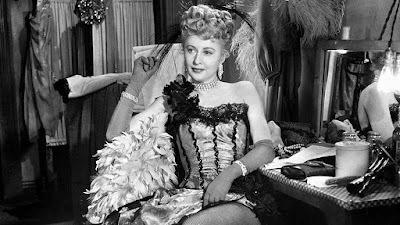 The role of Naomi provides much for actress Stanwyck to play with as the character faces those she abandoned, pretending that the life she chose has been a success. She is naturally reticent, but puts on the brave face and plays her part to the hilt. All I Desire offers solid performances from supporting players including Richard Carlson as the rejected husband. I note that Carlson appears in many of my old standby favorites such as The Little Foxes, Creature from the Black Lagoon, Beyond Tomorrow and his charming debut in 1938s The Young in Heart. Marcia Henderson (Thunder Bay) plays the oldest daughter Joyce, who is the most resentful of her mother's leaving her in the role of female head of the household. Lori Nelson is ebullient as a young girl with plans. 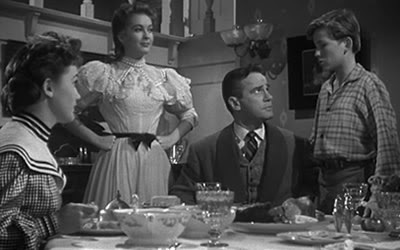 Billy Gray, probably the finest of the younger actors at this time, plays the youngest child in the family, the one most in need of sure boundaries. Maureen O'Sullivan (Tarzan and His Mate) plays a colleague of Carlson's character, a woman whose life would be different if not for the shadow and presence of Naomi. Lyle Bettger (The Greatest Show on Earth) is Naomi's former lover "Dutch", a man with a long memory and a short fuse. I once saw Bettger play a good guy and was in a daze for a week! What a treat to see future The Big Valley mother and son Barbara Stanwyck and Richard Long cutting a rug in All I Desire. Universal-International in the 1950s cornered the market on good looking, dark-haired chaps and All I Desire gave many of them a chance at a scene or a line or two: Guy Williams (Zorro), Stuart Whitman (The Comancheros), Brett Halsey (Follow the Sun), and Richard Long (The Big Valley) as Joyce's boyfriend. 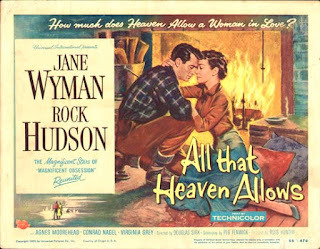 One scene in All I Desire compares interestingly to a similar scene in the later Douglas Sirk film, 1955's All That Heaven Allows. In All I Desire Naomi accidentally shoots "Dutch" and has the following exchange with her longtime family doctor played by Thomas Jackson (Little Caesar). Dr. Tomlin: "I am an old man and I say what I think. I'm the doctor and I know Riverdale. As soon as I make my report to the police - Dutch Heinemann shot by a woman - "
Naomi: "But I told you it was an accident." Dr. Tomlin: "It makes no difference what you tell me. Maybe it was an accident. Do you think that'll make any difference? Already out there those maggots have got it all over town. The whole story in the worst way. The oldest and the nastiest story in the world." Naomi: "What can I do?" Dr. Tomlin: "You can go back to Chicago, for Henry's sake and the children's." Naomi: "Funny, isn't it? How things work out." In All that Heaven Allows young widow Cary Scott played by Jane Wyman consults her family doctor played by Hayden Rorke about chronic headaches. The real issue is her unresolved feelings for a younger man. Cary: "Well, Dan, what's the verdict?" Dr. Hennessy: "I was just going over the findings. There's nothing organically wrong with you, Cary." Cary: "Well then why do I have these headaches. It's not my imagination and they're getting worse all the time." Dr. Hennessy: "You're punishing yourself." Dr. Hennessy: "For running away from life. The headaches are nature's way of making a protest." Cary: "Will you give me something for them?" Dr. Hennessy: "Do you expect me to give you a prescription to cure life? Sit down, Cary. I want to talk to you. Forget for a minute that I am your doctor and let me give you some advice as a friend. Marry him." Cary: "Well, there's no point in discussing that. It's all over." Dr. Hennessy: "Apparently it isn't. You still have the headaches." Cary: "But that's silly. And anyway, how could I marry him. The whole thing was impossible from the beginning. Why, you know Dan in a place like Stoneingham you can't ignore conversation and ... "
Dr. Hennessy: "So you gave up a man you were in love with because you were afraid of Mona and the others, and you have the grand satisfaction of being taken back into the fold." Cary: "Well, I was thinking of my children." Dr. Hennessy: "You're just as lonely as you were before - lonelier in fact. Kay married and Ned abroad, so what good was your noble sacrifice. Cary, marry him." Cary: "It's too late. And maybe he's found someone else. Anyway, if he really loved me he would have come to me." Dr. Hennessy: "No. If you loved him you'd have gone to him in spite of the town, the children, everything. Cary, let's face it, you were ready for a love affair but not for love." The two films are set half a century apart although only a couple years by production. There is a world of difference in the attitude and advice given to the leading character in terms of understanding and empathy. How much that tells us about the times. 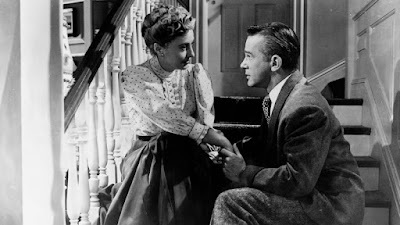 Barbara Stanwyck would only make one other film with Douglas Sirk, 1956s There's Always Tomorrow. 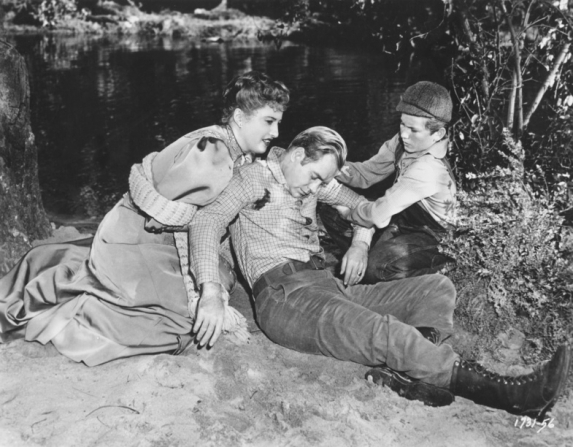 Here again he would turn the down unexpected roads in a family melodrama by focusing on the dissatisfaction of a neglected husband and father. Fred MacMurray is relatable as the father, and Barbara Stanwyck adds another must-see portrayal as a single woman who rethinks her choices. Beautiful tribute to one of the great actresses! 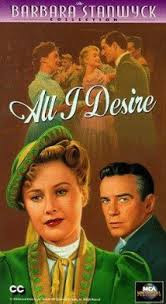 I am also a big Douglas Sirk fan, so I am excited to check out All I Desire, which I have never seen. I too first "met" Ms. Stanwyck as Victoria Barkley on The Big Valley. She certainly did have a wonderfully long and rewarding career, even starring in the miniseries of The Thorn Birds and on the nighttime soap opera The Colbys in her later years. She never won an Oscar, but she never stopped working, and entertaining us! Barbara Stanwyck's attitude toward her work, treating television with the same respect as her films, gave her that longevity that endeared her to so many - giving us the opportunity to get to know her. Class right down the line (to paraphrase Phyllis D.). Thanks for stopping and commenting. I'm going to spend a few hours getting lost in your blog. How much do I love this line? : "Universal-International in the 1950s cornered the market on good looking, dark-haired chaps." That's hilarious. Great review. You've definitely convinced me into checking this one out--the entrance alone should be worth it. Stanwyck, of course, never disappoints and the movie is strangely compelling because it never really goes where you think it will. Do we get to see Stany dance in that fetching showgirl dress? Not to any great extent. You'd be better off sticking with "Lady of Burlesque". I figured as much. I only bring it up because she had to have been pushing 50 in this movie and she was still hot enough to wear a dress like that! I read years ago that the lady gave up sugar as part of her health routine. While I admire that sort of resolve and am impressed by the results I could never give up the sweet stuff. I hadn't realized how All I Desire speaks to All That Heaven Allows. If we look closely, I bet we can find many more coincidences besides the accident scenes. But do you want to know a secret? My favorite characters in the movie were the two housekeepers who finally become a couple in the end. I wish this film was longer and explored Naomi's drama in a more risky way. You are so right. The subplot with Nora is very involving and a sign of how well thought the movie is. Yes, more of the story would have been very nice and you can't say that about many. I have this film as part of a Stanwyck set, but have yet to watch it, despite my affection for Douglas Sirk. I like how you look at this film's place in Sirk's filmography, as well as its relation to All That Heaven Allows. I'm excited to watch it now and see the connections myself. Great post! Enjoy the movie. I hadn't heard of it or seen it until it was released on VHS back in 1985. It appears to have been one of those movies that got lost over time. We're lucky to have it now. All That Heaven Allows is my favourite Sirk movie so I was interested to read about its parallels with All I Desire (which I haven't seen). He really did excel at simple but effective stories that put suburban America under the microscope - and this looks like no exception. The early setting of the film makes the story all that interesting to me. I hope you have the opportunity to check it out. I second your – and the previous commenter's – observation re: Universal cornering the market on dark, handsome fellows. I'd never really considered that before. The time period and costumes give the movie an added interest. I think you will find it worth your time. I really like this film and am interested in what you say about it being a turning-point in Sirk's career. So far the only one of his earlier films I've seen is the one he made just before this one, 'Has Anybody Seen My Gal', another period piece where the mood is certainly much lighter than it is in this. Sirk always loves shots of windows, doesn't he, both people looking in from outside and those who are trapped inside! I also love your description of 'Dutch' as a man with a long memory and a short fuse. And your comparison with 'All That Heaven Allows' and the changing attitudes is fascinating. Yes, we could go on about "Sirk's windows' couldn't we? You can't watch any of his films without feeling deep emotion. He was a master manipulator and I mean that in the best way. Hi Patricia. Thanks so much for participating in the blogathon. Sorry for the late reply. I have only just returned to blogging after a long hiatus, and am only reading the articles now. I don't know if you saw my announcement post on Facebook the other day about my upcoming blogathon in April. I would love to invite you to participate. The link is below with more details. Loved your review, Paddy. So happy to find another fan of this one. I too love that scene where Naomi goes to watch the school play and enters in that stunning white gown. I also love Barbara Stanwyck's performance in that scene as Naomi watches Lori act. This film is a little gem that deserves to be much better known and appreciated. I just wish it had been a bit longer. Thanks so much for reading, Maddy. We don't often find others who are fans of this film. I agree. So many movies will drag on, but I would have happily spent more time with Naomi.